The APEX® sewage treatment plant is a Registered Trademark of WTE Ltd. 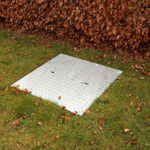 The APEX® sewage treatment plant is designed for use where the installation of a septic tank is either unacceptable or impractical and a connection to the main sewer impossible. The APEX® domestic sewage treatment plant offers an extremely efficient and unobtrusive means of sewage disposal. The APEX is a three stage sewage treatment plant. Manufactured entirely from robust and corrosion free materials, the APEX™ biodigesters incorporate unique and patented features to make sure simplicity and efficiency of operation whilst being able to consistently achieve the ever more stringent standards of discharge effluent quality being required by the Environment Agency. Available in a range of sizes to suit almost any application from a single residential property, hotels and restaurants or a major industrial / commercial complex, the APEX meets the specific requirements of each individual situation. The APEX has the EN 12566-3 2005. The APEX® was the ONLY electric sewage treatment plant in the 'ECO HOMES' section at the Homebuilding and Renovating show 2010 due to its very low electric consumption, very high effluent quality and minimal servicing requirement. Very clean effluent giving 11mg/litre BOD and 7mg/L Ammoniacal Nitrogen that can even be discharged to a DRY ditch. Can be designed to be MOBILE wastewater treatment systems for disaster areas, temporary construction sites, etc. The APEX® system has been tested for 38 weeks in Germany for BS EN 12566-Pt3 and has produced some of the best results in the market place, 20BOD-30SS-20NH4 being the standard to achieve. The APEX® sewage plant actually achieved a 96.2% treatment efficiency ratio in the EN 12566-3 2005 test, which equates to 11BOD-16SS-7NH4, a far better quality of effluent than the majority of the competition. The APEX treatment plants have a 25 year warranty on the tanks and a 2 year blower warranty. Our price also includes for a compressor failure alarm system as standard, which also forms part of the mandatory requirements. Installation of the APEX biodigester requires no specialist equipment and can be carried out by any competent contractor, quickly and simply. Once installed, the APEX sewage plant is completely unobtrusive, even the largest plants. By using only the best and most reliable components and with no moving parts within the sewage unit, maintenance requirements and running costs are kept to an absolute minimum. In recognition of increasing environmental requirements, APEX sewage treatment plants undergo continual development to improve process efficiency and cost effectiveness. Whatever your need, Crystal Tanks can offer all design and regulatory approval help that is needed for any type of application. Please contact our technical department for further details. The APEX wastewater treatment plant is of a single tank design and incorporates Primary Settlement (PST) Biological Treatment (Biozone), and Final Settlement (FST) within the same structure, allowing delivery to site as a complete unit to give a simple and straightforward installation. No other tanks are required except for larger applications ( over 300 p.e. ) where a modular system is provided or where extra treatment is required to meet more stringent effluent quality standards or where effluent re-use is proposed. The APEX sewage treatment plant has been designed to optimize the aesthetic qualities of the final installation by ensuring that there is minimum visual impact. The APEX process is also designed in accordance with the requirements of BS 6297. The primary settlement tank (1) is a two stage tank designed to maximize the removal of gross and suspended solids before transfer of the settled effluent to the biozone for treatment. The primary settlement tank also incorporates for a sludge storage volume (based on full load) depending on the desludge periods as identified for each application. The biological treatment phase (2) of the sewage treatment plant utilizes BAF technology (biological aerated filter). Air is blown from the compressor (3) into the biozone (2), which incorporates two proven principles of biological process - a fixed film reactor for process stability and a suspended floc dispersed growth system for high transfer rates and operational control, to make sure a stable treatment process which is largely unaffected by shock loads. The sewage treatment process incorporates a submerged, high rate, plastic media on which a fixed film of biomass is grown. This film takes nutrition from the incoming settled effluent and is provided with oxygen by means of a small blower unit which aerates the media through HDPE membrane diffusers to provide fine bubble aeration. The action of the fine bubble aeration is carefully controlled to give optimum oxygen transfer rates and to provide a scouring action to slough off excess biomass to keep the thickness of the fixed biological film at optimum levels, thereby preventing the production of anaerobic bacteria and ensuring maximum sewage treatment process efficiency. The fact that the media remains submerged allows for an element of suspended floc dispersed growth which basically means that there will be biomass which is unfixed to the media but achieves sewage treatment through suspended aeration. The biozone incorporates a two stage process as standard that allows for constant mixing of incoming settled effluent to provide optimum treatment stability and to avoid any short-circuiting. The use of a two stage biozone in the sewage treatment plant ensures a high degree of process efficiency to not only cut B.O.D. levels to that required, but will also achieve reductions in ammoniacal nitrogen in excess of standard requirements. The final settlement tank is designed in accordance with the requirements of BS 6297 to ensure relevant surface areas and rise rates are achieved to provide maximum settlement of any suspended solids before discharge. The APEX™ sewage system also incorporates continuous and automatically timed humus sludge return systems (4) to return humus sludge from the final settlement tank back to the primary settlement tank. This provides for continuous recycling of treated effluent back to the P.S.T. to not only provide dilution of incoming settled effluent and protect against accidental poisoning of the plant, but to also make sure continuous flow during periods of low or no flow, thereby keeping the biomass in prime condition. Click on this link to see details and photos of an 80 person APEX sewage plant installation at the APEX Inn, Fotheringhay by Welland Valley Construction - a very good installation, well done. A APEX 50 person sewage treatment plant being installed in a very high water table location. Note the de-watering of the hole, using pumps to remove the water in a side-sump, as it flowed in from the surrounding soil. Note also, shuttering to prevent the sides of the hole collapsing. A very difficult site with a successful outcome thanks to the great design of the APEX tank. Installed by White Rose Installations Ltd. Tel. 01757 289555. Nationwide coverage.